It was tough getting out of bed this morning, I was not thrilled to hear my alarm. Getting back into the grind after a 3-day weekend can be tough and today was especially tough because I think I’m still in summer play mode, I’d rather be outside being active than sitting in an overly air-conditioned office. Today was an especially beautiful day, sunny and not too hot, and it kept me thinking about being back at the lake, hiking in Tahoe or running a scenic trail. Sigh. I did have a wonderfully sweet and filling breakfast smoothie. Trader Joe’s Very Cherry Berry Blend is awesome in smoothies adding a rich sweetness that goes perfectly with SunWarrior Vanilla Protein powder. This smoothie also has spinach, red cabbage, chia seeds and a carrot. I spent lunch helping my mom babysit my hyper nieces again today and somehow found time to create this plate. 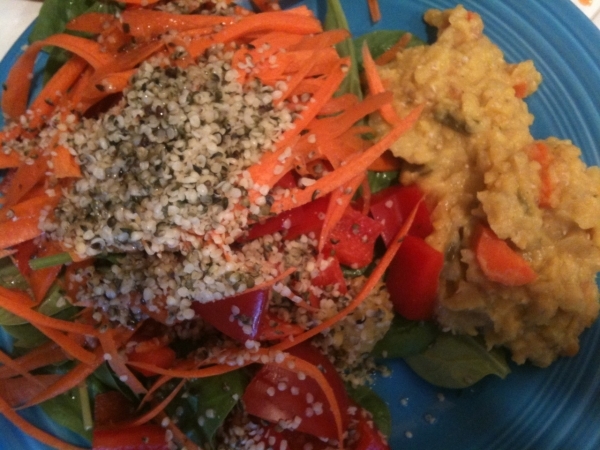 Spinach salad topped with hemp seeds and Annie’s organic dressing with orange-lentil leftovers. Yesterday I found an opportunity to try something new – sprouting my own quinoa following the instructions in Ani’s Raw Food Essentials. 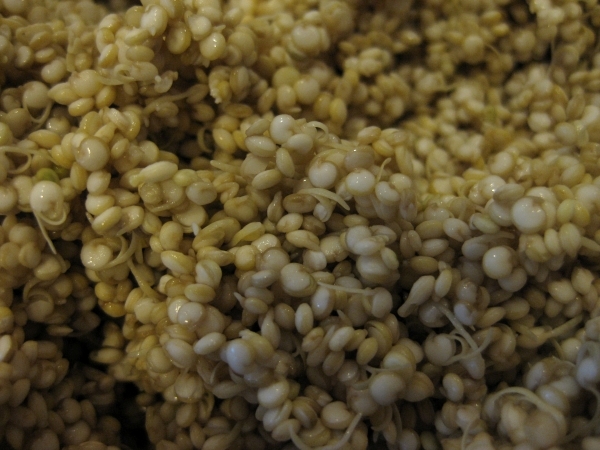 I soaked the quinoa for 4 hours, drained it in a nut milk bag and set aside to sprout for another 5 hours. Ani recommends consuming as soon as possible after sprouting, but noted that it’ll keep in the fridge for 1 day – an option I had to exercise with my work schedule and have it for dinner tonight. 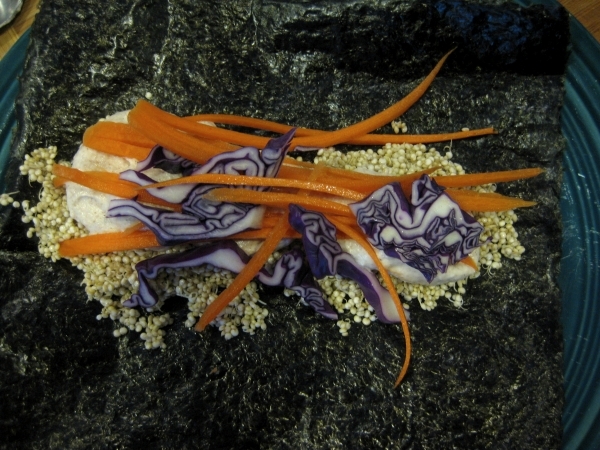 One of Ani’s serving suggestions is to roll in a nori wrap with favorite sauces and veggies. So I created her almond-based “peanut” sauce in the Vita-Mix and decided to try my luck at rolling nori wraps again. I layered the sprouted quinoa, sauce, carrot strips and red cabbage into the wraps and chickened out of cutting them into neat little sushi rolls opting for nori burritos instead. 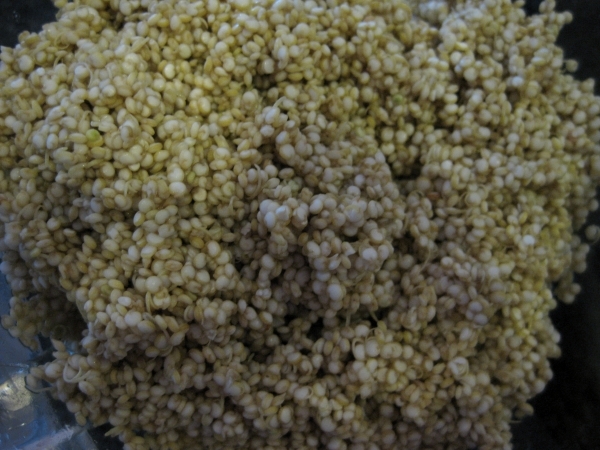 The tangy sauce livened up the quinoa nicely and hubby suggested adding a wasabi sauce to it for more kick. This would also be great with Gena’s Curried Cashew Spread. Love the nori wraps and in your honor today, i bought those same arti hearts you had the other day from my TJs run. I didnt really feel the tempeh, so put it back but did buy a block of their extra firm tofu. Not sure I love the texture, the groc store one Ive been buying (not nasoya..spacing out the name…)is actually firmer than TJs but it worked fine. I am always impressed with your skills! Can’t believe you sprouted your own quinoa. Also, I tried chia seeds in my smoothie for the first time last night. Why wasn’t I putting them in there before? Ooh, I’ve been thinking about trying the at home sprouting thing. You make it look very tasty! 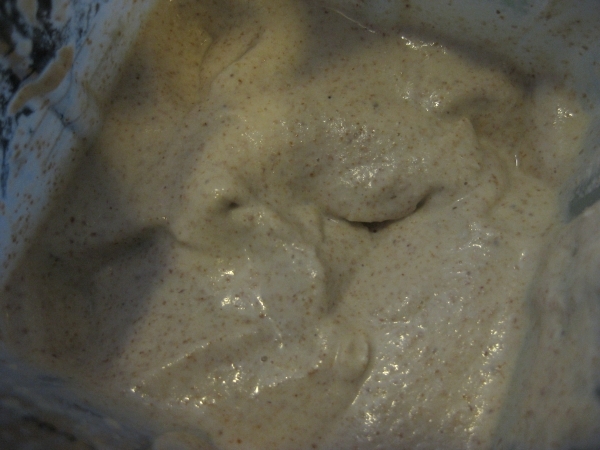 I really want to try sprouting, especially sprouted chickpeas so that i can make raw hummus, yum. 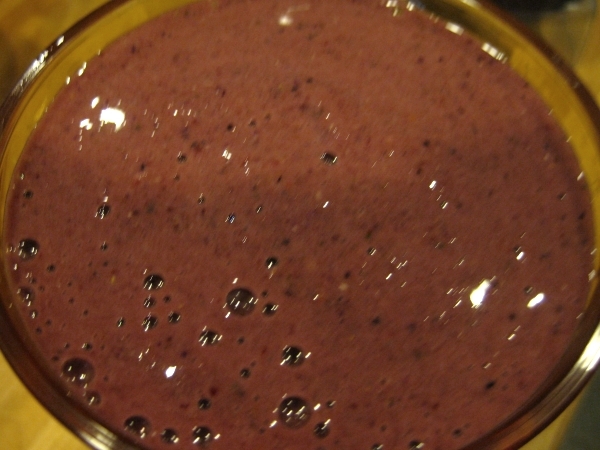 Your smoothie sounds delicious too… know what i’m having for breakfast tomorrow! Wow, that looks really good! I forget how much I like nori burritos – I’ll have to make some up tonight. I have tons of farmers market produce in the fridge! I also love the berry cherry mix from TJs. I buy all my frozen fruit there for smoothies. 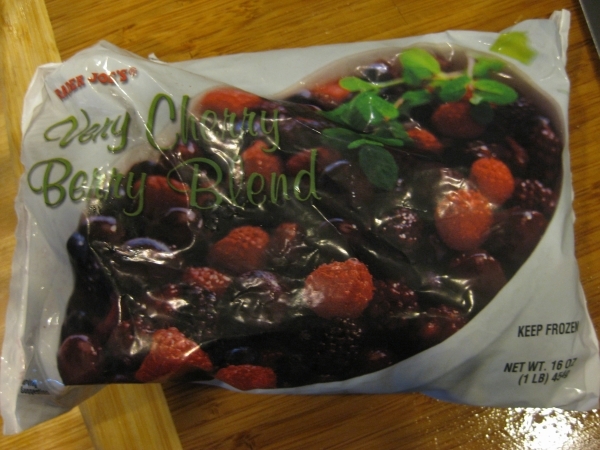 love those frozen berries from tj’s. so sorry you had to get up-hate having to get up for work and am already dreading it when the school school starts up. you are a sprouting queen! 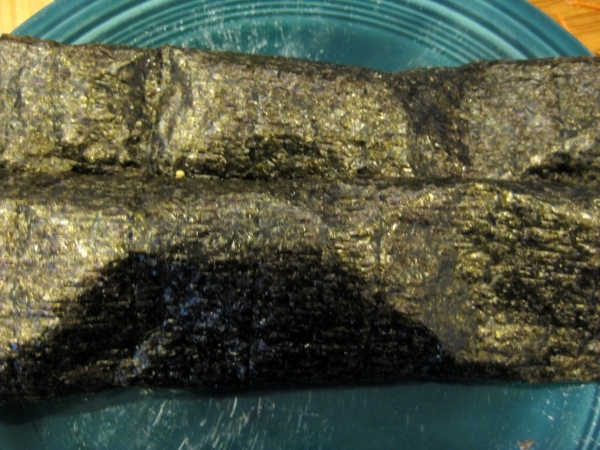 The nori rolls look great! Babysitting hyper nieces…that’s a tough job. Good luck to you! 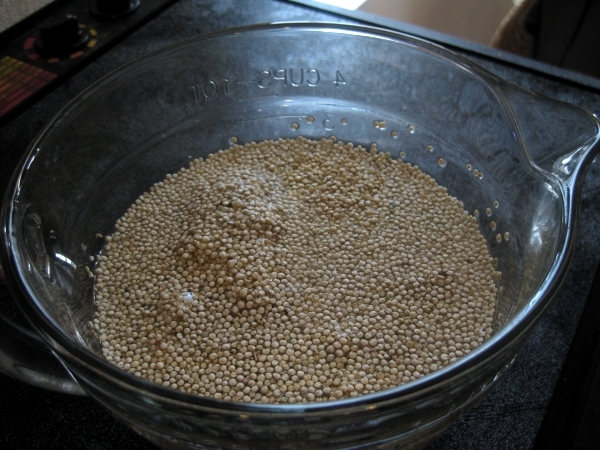 What’s the advantage to sprouting the quinoa? I guess I didn’t know you could do that and in a relatively short amount of time, that’s pretty cool!